Sen. Randy Baumgardner, R, Hot Sulphur Springs, on the Senate floor May 1, 2018. 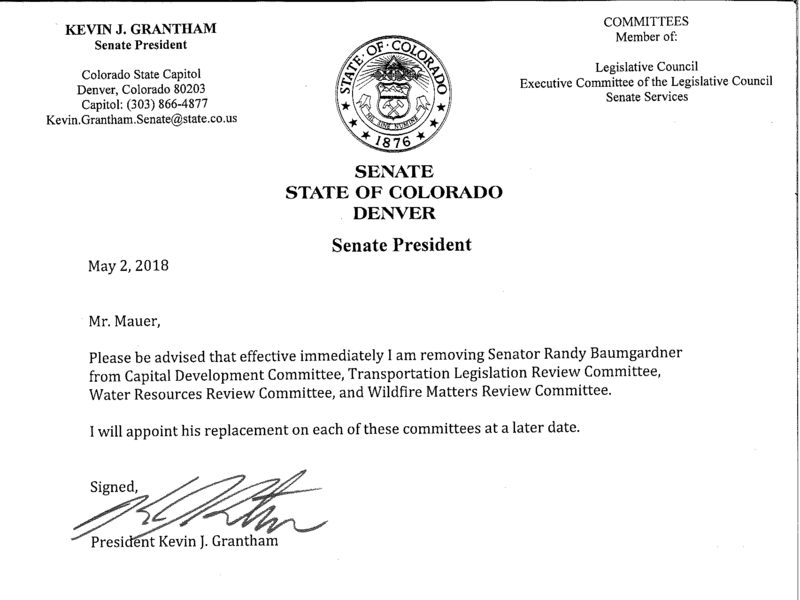 Republican Senate President Kevin Grantham has stripped Sen. Randy Baumgardner, R-Hot Sulphur Springs, from serving on any active Senate committees effective as of May 2. Grantham requested the change after workplace harassment allegations from nine people have been found credible by two outside investigators. Republican Senate President Kevin Grantham has stripped Sen. Randy Baumgardner, R-Hot Sulphur Springs, from serving on any Senate committees effective as of May 2. Baumgardner survived a Democratic-led expulsion vote on April 2. It hinged on the findings of just one of the three investigations, which concluded that he more likely than not grabbed and slapped a former legislative aide’s buttocks. “Nothing has shifted or changed in that regard,” said Democratic Senate Minority Leader Leroy Garcia. He said he still believes Baumgardner should not hold office. “The behavior is unacceptable, un-welcomed and will not be tolerated,” he said. The latest investigations from Littleton Alternative Dispute Resolution Inc. found allegations that Baumgardner created a hostile and offensive workplace in 2016 to be credible. Grantham said earlier that he would not ask Baumgardner to resign over the allegations. Baumgardner has denied wrongdoing. Editor’s Note: We added that Randy Baumgardner is only being removed from active committees meeting over the summer. He still technically serves on the Agriculture, Natural Resources and Energy Committee and the Transportation committee, which are not meeting. Two accusers who filed workplace harassment complaints at Colorado’s Capitol against Sen. Randy Baumgardner are now releasing the full investigative findings to the public. The investigations from Littleton Alternative Dispute Resolution Inc. found allegations that Baumgardner, a Republican from Hot Sulphur Springs, sexually harassed people and was inappropriate to be credible. In a story on Monday (April 23), we reported on some of the key findings, involving six additional people who brought allegations as a result of the investigation. Senate leaders expect to meet soon to address next steps in possible punishments for Sen. Randy Baumgardner. Three independent investigations by two agencies have found allegations of sexual harassment against him at the Capitol credible. Democrats are pushing for swift action. Baumgardner, a Hot Sulphur Springs Republican, survived an expulsion vote on April 2. That vote hinged on the findings of just one of the three investigations, which concluded that Baumgardner more likely than not grabbed and slapped a former legislative aide’s buttocks. The two other investigations had not been finalized at the time of that vote. They were only released to the accusers last week. We made them fully available to the public on April 24 with the accusers’ consent.